This product is not purchased but has a coupon every time. 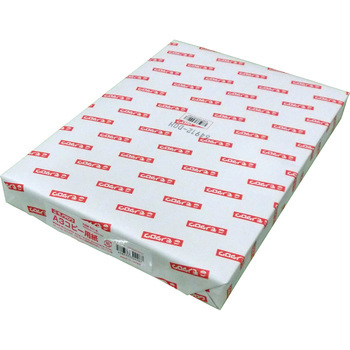 As it is normal high quality paper, it can be used without dissatisfaction. This review is about item#37652011. We purchased for the first time to use with ink jet printer. The paper is a little hard and crisp. The print level is normal, some fine characters are good, and the white letters are not crushed by the normal font size, so I think that it is a good level. There is no special request because it is free of charge, but there is also a preference for color, and the color is slightly ivory than the copy paper normally used. There is no problem with the paper quality. It was a little disappointing that the color was not whiter than the copy paper I used until now. As I got used while using it, I made it normal. Price is cheap and can use without problem. It is also attractive to arrive early. There was also a review of other people, but I think that it is good if the box can be reused if the cardboard is a type with a lid. It is a good item for the price. It is saved because it is a consumable item. It is a little thick, but it has a good feeling of whiteness and lack of transparency, and it uses a lot of double-sided printing. It is good because there is a lot. There is no problem with the use of inkjet. This review is about item#60857711. We use in office system. It is useful because I print on PCx5. This review is about item#60857702. You can print and copy without any problems. I am satisfied with the price cheaply. As it was a monotaro product, I expected it, but it was ordinary. But there is no problem in the feeling at all. We use well recently, but color is easy to look bright and easy to use. It was saved because it arrived the next day. Paper quality is firmer than expected, too and thinks that it is more than price. Paper quality is quite good Easy to use Thank you. When color printing is performed, it is popular if color development is easy to see well. Therefore, I will be able to use it on a daily basis. It is thicker than I thought, and it is suitable for the program. It is easy to count even to count the number. The first thing I feel especially about is the color of the paper, or the natural white color. I feel like I have not been bleached strangely. After that, here is the most important paper quality is very good. It is personal subjectivity, but I think that it is the cospa strongest in this class of this price. Recommended for home use. Normally used as printing paper. It is very convenient. Paper is strong and cheap. As cospa is good, we will try to buy here from now on. This review is about item#2308032.